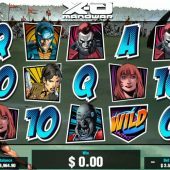 X-O Manowar slot is trademarked game based on the Valiant Comic characters and their fantasy world of magic and battles. Pariplay aren't strangers to the odd branded game though as we saw with their imaginative interpretation of the spoof comedy horror Sharknado which they did quite well it has to be said. Likewise here we have some quality graphics where you begin you adventures with a medieval jousting field behind the transparent reels and some portentous classical music to remind you of your peril. You can change these scenes as you progress by getting base game wins, but will these men also declare war on your playing balance? The standard 5x3 reel grid has 25 pay lines and there is a lot going on! There are five characters which can all appear stacked: X-O Manowar himself pays 120x bet for a full line of 5, Primary Reebo 60x, Colonel Capshaw 40x, Trill 20 and finally Saana at 14x stake. The 5 card values pay 2x - 8x and there is a Wild possible on all reels offering the same as the top pay X-O Manowar. You will see a bonus icon too on all reels of which we need 3 or more to trigger one of the many character bonus rounds but first we must check out the cumulative features which will eventually change the chapter of this story. On the left of reel 1 is a figure of Shanhara behind 5 orbs. Every win will partly light up the lowest unlit orb with pink light, and this is for each pay line. You will often win with 2 or more lines simultaneously on the reels which will fill it quicker. Once any orb is full the game randomly awards either free spins (10, 15 or 20) or 5 paid spins with any Wilds that occur becoming sticky for either 3, 4 or 5 spins or finally a cash award of 6 to 32x bet. The free spins have no enhancement though. Once you have lit all 5 orbs and had their random cumulative award described, you will change chapters and find the reels are now overlaying another scene with an alternative character guarding the right of the reel set. The Hara Vine - pick up to 6 flowers from the vine and you will total afterwards between 9 and 40x stake. Battle Commander Thrill - choose on of three weapons for him to defeat the robot with, get 2 to 20x stake. Vine or Not? - scan the people and find a vine hiding in one. Three choices so you could win zero or 2-25x bet. Defend the Earth - shoot at the 10 battle craft and find the diamond with three choices. You can get zero or 4-18x bet. The Trial of Shanhara - move over a grid on the floor using the arrows on them to defeat enemies in wait. You end up with 4 to 32x bet.